The mountain was originally called Tahoma or "Great snowy peak" in Yakima Indians. Captain George Vancouver named it Admiral Peter Rainier of the British Navy during the scouting expedition May 7, 1792. This name has been hotly contested for over 100 years, because the Americans that she did not should be named after a British officer, who had never been in the U.S.
Mount Rainier is a large active stratovolcano (also known as a composite volcano) in Pierce County, Washington, USA, located 54 miles (87 km) southeast of Seattle. It towers over the Cascade Range as the most prominent mountain in the contiguous United States and Cascade Volcanic Arc at 14,411 feet (4,392 m). 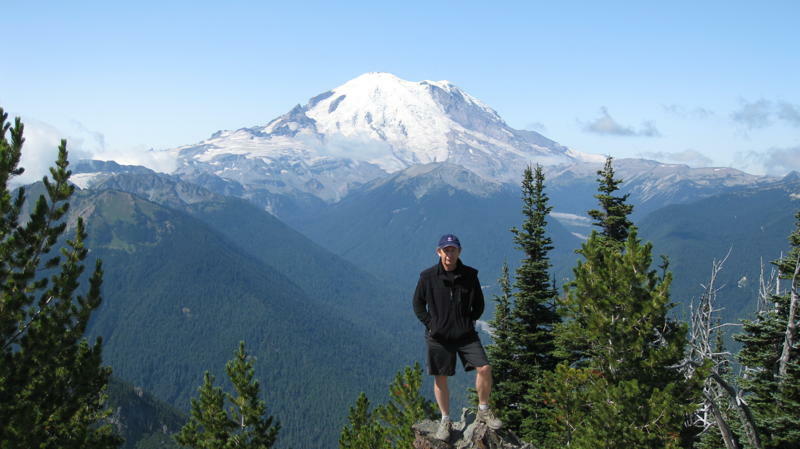 It is the highest mountain in Washington and the Cascade Range. 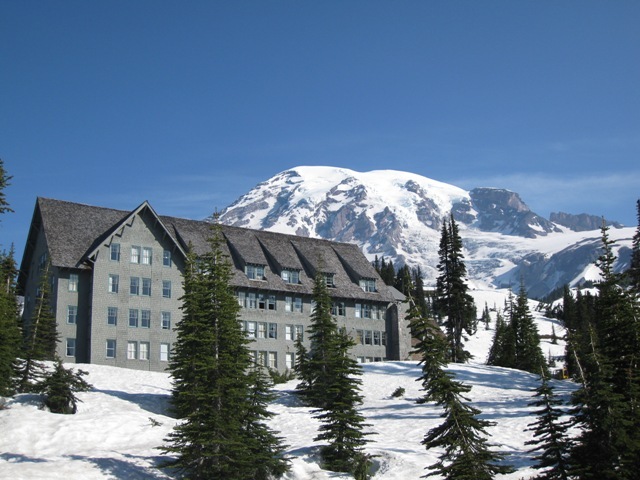 The mountain and the surrounding area are protected within Mount Rainier National Park. With 26 major glaciers and 36 square miles (93 km2) of permanent snowfields and glaciers, Mount Rainier is the most heavily glaciated peak in the lower 48 states. The summit is topped by two volcanic craters, each over 1,000 feet (300 m) in diameter with the larger east crater overlapping the west crater. Geothermal heat from the volcano keeps areas of both crater rims free of snow and ice, and has formed the world's largest volcanic glacier cave network within the ice-filled craters. A small crater lake about 130 by 30 feet (40 by 9.1 m) in size and 16 feet (5 m) deep, the highest in North America with a surface elevation of 14,203 feet (4,329 m), occupies the lowest portion of the west crater below more than 100 feet (30 m) of ice and is accessible only via the caves. 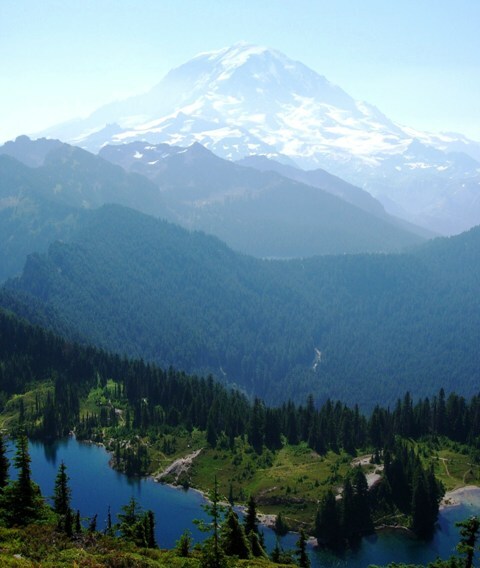 Mount Rainier has a topographic prominence of 13,211 feet (4,027 m), greater than that of K2 (13,189 feet (4,020 m)). On clear days it dominates the southeastern horizon in most of the Seattle-Tacoma metropolitan area to such an extent that residents sometimes refer to it simply as "the Mountain." On days of exceptional clarity, it can also be seen from as far away as Portland, Oregon, and Victoria, British Columbia.